Cockroaches belong to the order Blattodea and vary in size from a Queensland Cockroach (Macropanesthia rhinoceros) at 70 mm long to the much smaller German cockroach at 10mm long,the latter usually found in food preparation and storage areas, both Commercial and Domestic premises. 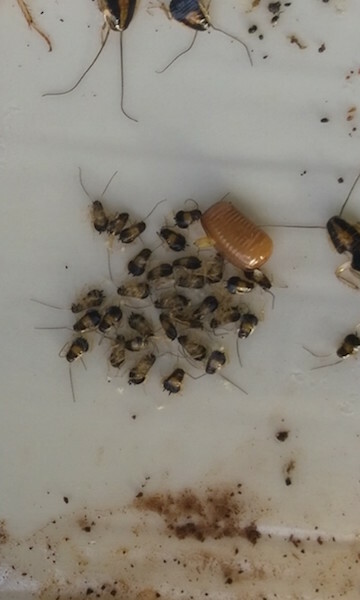 Native and German cockroaches. Any look familiar?? 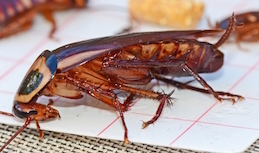 Cockroaches are primarily scavengers, feeding on dead animals and plant matter. German cockroaches living in kitchens feed on food scraps and other food products, hence the importantce of cleaning up and hygiene in all food preparation areas. 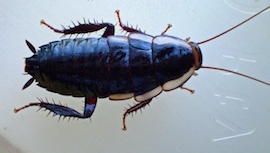 Most cockroaches are nocturnal unless there are very high population infestation levels when they will be seen running around during the day. Cockroaches are of some considerable economic importance. Not only destroying our foodstuffs, but also foul whatever they eat with their excreta. 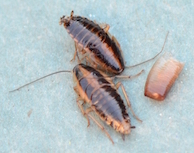 Cockroaches are responsible for spreading many diseases, especially food poisoning, as they live and breed in the same areas where food for human consumption is stored and prepared. The most important bacteria involved in food poisoning are: Salmonellae, Clostridium Welchii and Staphylococci. Salmonellae is associtated with pig, poultry and cattle products in the kitchen. The main source of Staphylococci that causes food poisoning is through the food handler. 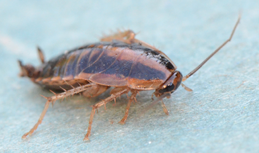 Exopest offers a range of chemical and non chemical treatments for cockroach species which are a Public Health pest. We do not recommend treatment for Native Australian cockroaches because they normally live outside and only come inside by accident as they forage for food. 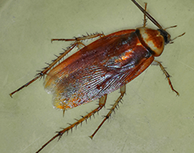 The Common Shining cockroach species (see picture above) is found all around Melbourne in the warmer summer months and is not a health risk. Non chemical treatment: Glue boards, Pheromone traps, Cryonite and good hygiene sanitation.